It is highly advised that you speak to a Salt Lake City slip and fall accident attorney to find out about the legal options available in your case. Contact Jardine Law Offices, P.C., today. Get a free consultation by calling at 801-350-3506. Home > Blog > Who’s Liable If A Property Owner Claims He Was On His Way To Put The ‘Wet Floor’ Sign When You Slipped And Fell? And right when you are thinking, “Establishing the property owner’s liability will be as easy as pie,” the owner of the property shows up and says he or she (or his/her employee) was on his/her way to get the “wet floor” sign and place it so their customers would be warned about the dangerous condition. And that is where it gets confusing. From your point of view, you have been injured in a slip and fall accident because the property owner failed to warn you about the wet floor. 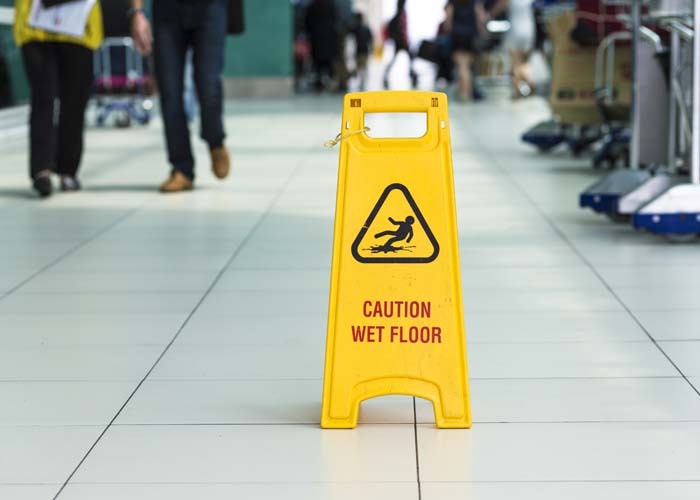 From the defendant’s point of view, on the other hand, he or she (or his/her employees) cannot be blamed for the accident because he or she could not be reasonably expected to place the “wet floor” sign immediately. What does Utah law say about ‘wet floor’ signs? Under Utah premises liability law, if you can demonstrate evidence that the property owner or his/her employees knew or should have known about the dangerous condition, or created the dangerous condition by their negligence or omission to act. “Failure to place the ‘wet floor’ sign is a clear violation of law,” you may be thinking. Well, not really. There is no federal or state requirement that a property owner or business use the yellow warning sign to protect their customers from dangerous condition. However, under Utah law, property owners are legally required to warn their customers of dangerous conditions in any reasonable way, but it does not necessarily have to be the “wet floor” sign. But let’s get back to the original question. What if a property owner claims that he or she (or his/her employee) was on their way to place the “wet floor” sign when the slip and fall accident occurred? Would the property owner escape liability in that case? How long was the floor wet or slippery before the property owner or employee went to get the “wet floor” sign? How long did it take them to retrieve the “wet floor” sign? Did the property owner or employee engage in any other activity on his/her way to get the sign, not realizing that someone could slip and fall in the meantime? Was there a reasonable opportunity for the property owner to station another employee to warn customers of the dangerous condition while he or she went to get the sign? Was the floor wet and slippery from a natural condition (such as rain or ice) or was it the property owner or employee who made it wet and slippery by spilling liquid or dropping food on the floor? As you can see, there are a plethora of factors to be considered to establish liability in this particular situation. It is highly advised that you speak to a Salt Lake City slip and fall accident attorney to find out about the legal options available in your case. Contact Jardine Law Offices, P.C., today. Get a free consultation by calling at 801-350-3506.